From a code point of view, Equinox is an implementation of the OSGi core framework specification, a set of bundles that implement various optional OSGi services and other infrastructure for running OSGi-based systems. The Equinox OSGi core framework implementation is used as the reference implementation and as such it implements all the required features of the latest OSGi core framework specification. The easiest way to get involved in Equinox is to try it out. 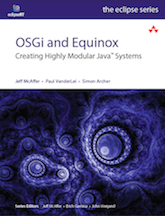 See the Quick Start Guide for how to get up and running with the standalone Equinox OSGi framework and the downloads page for more information on acquiring various Equinox OSGi bundles. If you want to find out more, ask questions, report bugs, get (or contribute :-) code, check out the community resources and look into the work going on in the framework, bundles or incubator components of Equinox.